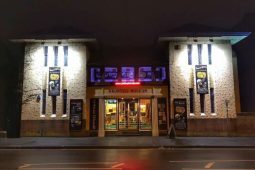 Described by staff as “an odd building with odd goings on” it spurred us on to take a closer look! 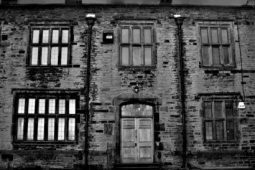 With all the layers of history and weird and wondrous artefacts throughout the building, on reflection of our guided tour we have no doubt that Moyse’s Hall is a ghost hunters dream! The spirit of a curious young boy has been sensed by staff and visitors on numerous occasions. He is said to keep watch in the doorway of the room that holds the horology (clock) collection. It is thought that the young lad takes a dislike to female visitors, who have reported the sensation of being pushed! A dark and foreboding mass described as either small or crouching down, has been seen in the great hall. The witness to this day still feels his hairs stand up on end when thinking back on the incident. Poltergeist activity has been witnessed in the reception area of the museum with a newly refilled leaflet stand being forced up by unseen hands, projecting the side of the stand one way and the leaflets sliding across the floor in the opposite direction! On another occasion, staff had come in early one morning to open up for the day and were astonished to see books scattered over the floor. Although when they had left the premises the night before the area had been clear and tidy! 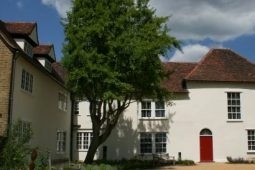 It is unknown who commissioned the building of Moyse’s Hall, although they must have been a person of great standing to build and extend such an impressive structure. The facing stone, quoins and columns are all made with Barnack stone which is the same stone that was used to build the nearby Abbey! Moyse’s was built in three phases and can be dated by the style of architecture to C.1140 when the west gallery was built with the solar above. The Norman doorway would have been the main entrance at that time with stone steps rising up the outer wall from street level. The extension of the Undercroft and the Great Hall above, are a latter addition dating stylistically to approximately 1180. The two windows in the south facing wall of the Great Hall are rare original survivals! The third phase of alteration is the Tudor rear part of the building, possibly built as a brewhouse. The surviving timberwork that’s visible in the regimental gallery has reeded moulding on parts, suggesting it was of higher status than a basic dwelling. It has had a varied use over the centuries; including a tavern and brewhouse, a debtors prison/bridewell/workhouse, a police station, and now a museum charting the towns early history. All the collections are incredible and well worth a visit, however I was drawn to the crimes and misdemeanours collection, housed in the “Death Room” as nicknamed by the staff. Here you can see prison paraphernalia, insights into superstition and witchcraft, mummified cats, a cursed gibbet cage and relics from the infamous Red Barn Murder! Is the spirit of the convicted murderer William Corder still around? His death mask, scalp complete with ear, and a book bound with his skin are on display for all to see… so would you blame him?! We were told of the peculiar tale of how William got to dance with the ladies long after his death! Join us for a night in the museum as we delve deeper into some of the mysteries that harbour within the walls of Moyse’s Hall. Those of you who jump easily may want to consider the haunting chimes of the clocks and the realistic waxwork figures that have spooked many guests in the past… this event is not for the faint hearted! 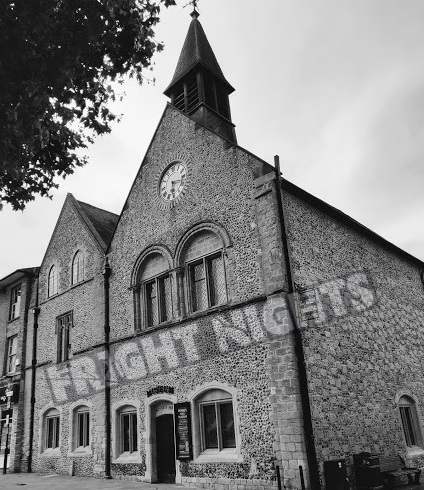 Fright Nights Norfolk & Suffolk have hired Moyse’s Hall for the night for a very exclusive ghost hunt. The night begins with a special tour of the hall detailing real-life experiences and historical information researched by experts. 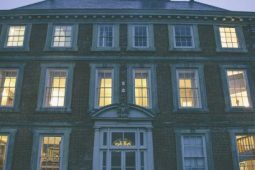 This will set the scene before you are joined by experienced paranormal investigators and mediums to try and experience activity in one of the most haunted buildings in Suffolk. Full use of ghost hunting and psychic equipment will be provided as well as hot refreshments throughout the night. Please note: Over 18’s only and NO pregnant women allowed as per our insurance cover. Venue is usually unsuitable for disabled guests due to the nature of the buildings but if in doubt, please contact us for more information. NO accommodation is provided unless specifically detailed. For more information please see our full terms and conditions here. All our events are fully insured, and a First Aider will be present. This event is organised by Fright Nights Norfolk & Suffolk. With thanks to Gemma Snow of Fright Nights Norfolk & Suffolk for the research & detailed write-up for this event. Event categories: Ghost Hunts.Event tags: Apparition, Castle, Castles, Divina-tion, Elemental, Equipment, EVP’s, Expert, Friday, Fright, Fright Nights, Ghost, Ghost Hunts, Ghosts, Glass Divination, Hall, Halls, Haunted, Haunted House, House, Hunt, Investigating, Mansion, Mansions, Medium, Mediums, Mill, Mills, Nights, Ovilus, Paranormal, Paranormal Investigation, Poltergeist, Rem Pod, Saturday, Séance, SLS Camera, Spirit, Spirit Box, Spirits, Table Tipping, Venue, and Workhouse.